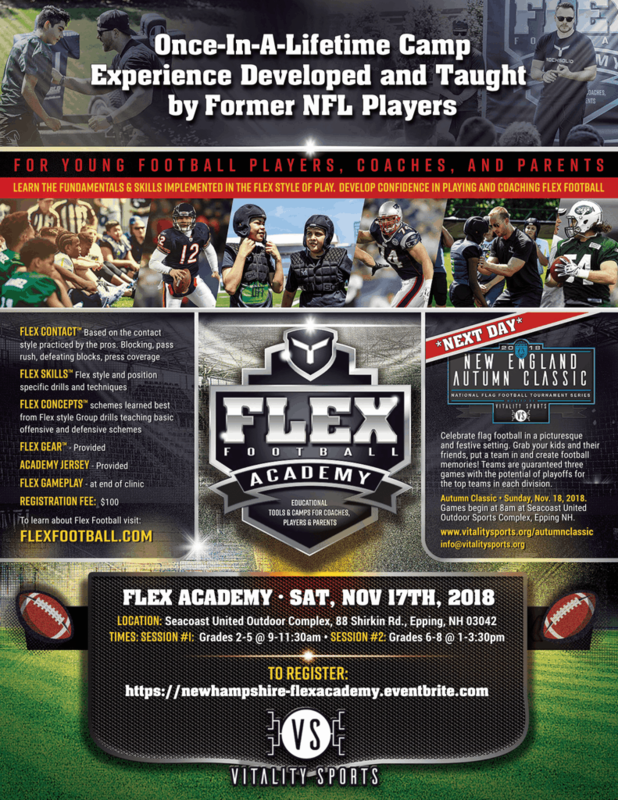 Flex Academy™ is an experiential in-person football clinic developed by the former NFL players at National Flex Football. They took inspiration from NFL coaches’ strategy of better protecting and preserving their pro athletes through utilizing high-tempo, low-impact “Flex” style practices, and made it their mission to bring this little utilized style to the previously neglected K-12th grade market, which makes up 97% of all football players. With a coaching staff made up of former or current elite football players, the Flex Academy™ is delivering the health benefits and skill development that are realized through the “Flex style” of play to the world for the first time through regional clinics. The ultimate goal is to develop football players in a smarter way, a way that doesn’t put repetitive impacts on the body. Culminating in a showcase of the revolutionary game-style of Flex Football™, players will experience the game that is bringing the thrills of football without the impacts. Parents and coaches will get a taste of the game which will be available through league play; ultimately leading to more participation and better prepared players and coaches. TO REGISTER FOR THE NOVEMBER 17TH FLEX ACADEMY, VISIT HTTPS://NEWHAMPSHIRE-FLEXACADEMY.EVENTBRITE.COM! -Registration and equipment fitting. Every player gets a Flex Academy compression jersey to take home! -Coaches Opportunity: Future Flex Coaches have opportunity to shadow NFLers to learn how to coach Flex Football basics.